Proplast Acrylic is a high performance, ready to use, thin-layer decorative plaster for internal and external applications. Proplast Acrylic consists of a unique composition of acrylic binders, mineral fillers, special polymers and pigments that provides a high quality decorative plaster can be easily applied by trowel on concrete or cement based substrates to produce a water repellent decorative coat for long lasting attractive smooth or textured appearance. Proplast Acrylic creates a decorative textured finishing on building facades externally. Walls and partitions covering internally. 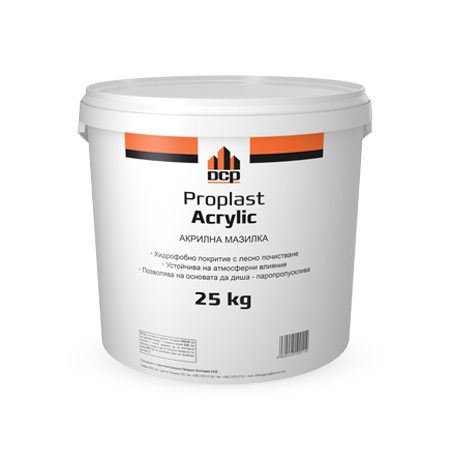 Proplast Acrylic is available in 10 kg buckets and 25 kg pails. Proplast Acrylic has 6 months shelf life from date of manufacture. Surfaces shall be sound, dry and clean from all contaminants. Lightly abrade the substrate using mesh 60 grade sand paper to remove laitence. Proplast Acrylic system can be applied on new or old surfaces of pre-cast concrete, normal concrete, normal cement/lime based plaster, aerated concrete, and gypsum plasters. The application of this system is not suitable on plastic and resin paints, varnish and oil-based paints. Prime the substrate using Proplast Universal Primer using a shorthair lamb wool roller or a soft brush at a rate of 5 - 8 m² per litre. Proplast Universal Primer should be used as a bonding agent and a balancing pH system between the different substrates and the acrylic plaster. This primer is a water-based system consisting of styrene copolymer binder. It also helps in the uniformity of colouration of the final coat. After priming, at least 24 hours are needed before applying Proplast Acrylic. Before the application, Proplast Acrylic shall be thoroughly stirred using a slow speed agitator. The material is applied with a stainless steel trowel. Different textures are obtained especially if a floating trowel is used where the working action can be done in circles, horizontally or vertically. Proplast Acrylic comes with two different systems which is related to the final desired finish. T type: is the normal textured uniform system; where the largest grain size appears uniformally on the whole finish. The T type comes with different large grain sizes which reflects in the final thickness. S type: is the scratch type finish, where a selected large grain particles will be spreaded in the finish and gives a randomly scratch effect on the finish. The size of these large grains effect on the thickness of the applied layer. To overcoat Proplast Acrylic , Repcoat FF can be used. All tools should be cleaned immediately after finishing using clean water.